The tiny village of Corias is located in the region of Asturias in northwest Spain. Dominated by the impressive Abbey of San Juan Bautista de Corias which stands along the bank of the Narcea River, the Abbey had a very powerful influence on the development of Asturias, with properties stretching right into the province of Leon. This former Benedictine Monastery was named after Saint John the Baptist, and this is where the King of Asturias and his family were buried. It was founded at the beginning of the 11th century following a donation made by a wealthy aristocrat, Count Pinolo Jimenez. Designed in a Romanesque style, it took just over twenty years to complete, and the first abbot to take charge of it was a relative of the Count. By the 13th century the Abbey was at its peak in power. However, in 1763 a great fire destroyed the entire building with the exception of the church and sacristy. It was eventually restored in the Neoclassical style in a rectangular layout and two courtyards built around the surviving church. One of its greatest treasures is the Christ of the Cantonada which is a 12th century crucifix, and is considered to be one of the finest examples of Romanesque art in the region. 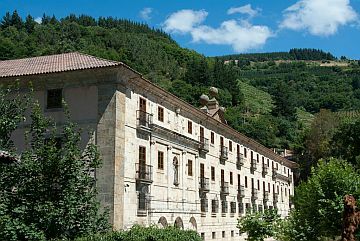 Today the monastery is now the Parador Hotel Corias, a four star luxury hotel with heated swimming pool, sauna, spa, Turkish bath and gym. The Parador also has its own restaurant serving excellent local cuisine. Another rather special building in Corias is the 15th century Asuncion de Nuestra Senora Cathedral. Standing on the site of an old Visigoth cathedral, it was designed by the Spanish masters of that time, Martín de Solorzano and Pedro de Ybarra. The great earthquake of Lisbon in 1755 was so immense that the shock waves went even as far north as Asturias causing the tower of the Corias Cathedral to collapse. Some of the most interesting features of the Cathedral are the Plateresque main entrance, the fan vaulted roof in the single naïve, and the 14th century cloister which today houses a museum containing several ancient works of religious art. Not far from Corias and directly south is Cangas del Narcea, the oldest and the largest municipality in Asturias. Be sure to visit the Basilica of Santa Maria Magdalena and its many beautiful palaces while you are there. Cangas del Narcea is also home to the Muniellos Nature Reserve. The reserve protects a woodland that covers over 13 thousand acres of predominately oak trees. It was originally to protect it as a hunting reserve, but nowadays hunting has been banned and even visitors access is strictly controlled. This is because they want to protect the wildlife which includes endangered species such as the Cantabrian Brown Bear and the Capercaillie which is a member of the grouse family. Corias may be small but it is certainly nestled in a beautiful part of Spain, albeit it somewhat remote. However, that is part of its charm if you are looking for a holiday where you can enjoy nature and get away from the crowds. The Parador Hotel Corias will also guarantee excellent accommodation in rather grand surroundings.